The basic idea here is to eliminate the floor space requirement between two fixed racks and utilize this space to accommodate more racks. Here the racks are mounted on the guiding tracks which allow forward and backward movement. This type of arrangement requires only one aisle for access and storage and retrieval of material. 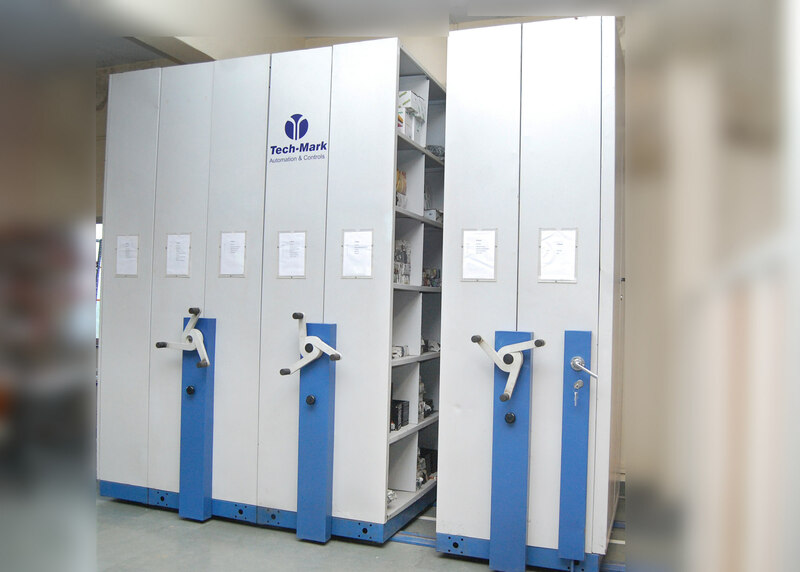 Tech-Mark™ offers you the ultimate mobile storage system with the latest ‘Easy Glide’ technology for a noise free, effortless and smooth operation for years together. The system offers security of stored material and proves to be very cost effective. This system requires lesser space than conventional racking systems/cupboards. It can save up to 60% of floor space compared to conventional static shelving or can increase the storage capacity by almost 100%. The system glides on steel tracks and consists of mobile base units onto which different shelving options can be assembled. When a particular rack is required, the appropriate aisle is opened up by mechanical or electrically driven bases. Only one aisle is required to service multiple racks. Sturdy and precision-fabricated racks using high quality material. Precisely engineered guide rails, gears, sprockets and chains for smooth, jerk-free movement and low noise or vibrations. Sealed bearings with lifetime lubrication. Sheet metal cladding, ensuring protection from dust, damage or theft. Position locking of racks during usage to ensure operator safety. Complete system can be locked to prevent unauthorised access. Space saving: Typically up to 60% space saving due to single aisle for multiple racks. Higher storage density: Due to single aisle, storage space availability increases by nearly 80% in the same area as that of conventional racking. Safety: Stored material is safe from dust, damage, external influences or theft and in-built system features ensure safety of operator. Reduced human effort: Very less human efforts required for moving the racks with heavy loads. Easy to locate the material: A list of stored material is available on an acrylic sheet holder on one side of the rack. This saves nearly 30% time of the user. Individual locking racks : Allows access to multiple racks simultaneously.